News emerged this week that Casper â€” the direct-to-consumer mattress company that is now becoming less-and-less direct-to-consumer and more-and-more brick-and-mortar (solo, and at Costco and Target) â€” intends to join the frenzied rush of money-losing companies headed towards a public offering in the midst of once-inverted yield curves and fears of recession. 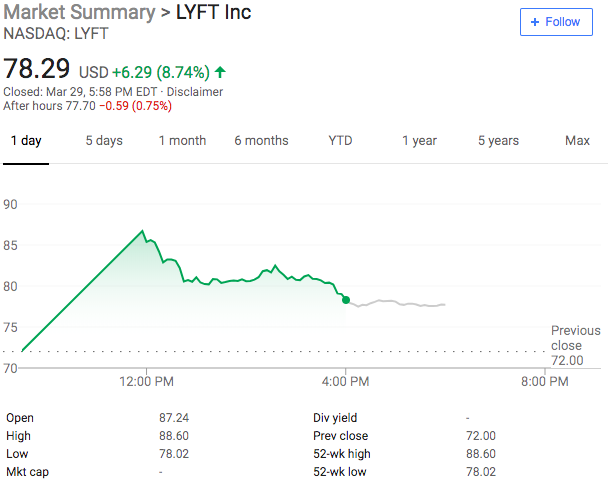 The appetite for IPOs is so frenetic that Lyftâ€™s IPO was over-subscribed after a mere two days of roadshow â€” this, notwithstanding the fact that the company (a) has blown through crazy piles of money and (b) is unsure of its business model and whether it will ever even earn a profit. It then priced above the high end of its initial range and then popped like a champagne cork once shares opened for trading. Speaking of Mattress Firm, we have projections there too: thank you bankruptcy!! And this allows for a fascinating juxtaposition. If weâ€™re doing our math right, that means Casper has a significantly larger per-store capex spend than Mattress Firm. On the plus side, unless theyâ€™re total frikken morons (or trolls), Casper likely wonâ€™t have competing stores sitting literally across the highway from one another. *** So, thereâ€™s that. "Normally you open a store, have to build presence, then the store loses money and eventually pays back after many years," Krim said. "We have such a productive digital business that weâ€™re profitable on day one of opening a store." Casper projects $450mm in EBITDA by 2023. In contrast, Mattress Firm projects merely $274mm. Casper has the benefit of landing brick-and-mortar space at a time when landlords are more forgiving with rents; it also has the hyped-up DTC narrative blowing at its backâ€Šâ€”â€Ša clear contrast to the old and stodgy market view of Mattress Firm (which, to be fair, also was able, over the course of its bankruptcy, to renegotiate a meaningful number of its leases with landlords). Said another way, Casper simply seems better positioned to omni-channel its way to success while incumbents like Mattress Firm continue to play catchup. Now, these are projections, right? So, query which kind of projection is more full of sh*t? Startup projections or bankrupted debtor projections? Itâ€™s a coin flip. In reality, the competitive posture of Casper vs. Mattress Firm four years from now is anyoneâ€™s guess. More likely than not, one or both of them are overly optimistic here. But if Casper is right about its projections, that could lead to a significant surprise for Mattress Firm. And given Mattress Firmâ€™s previous strategies, would you want to put your money on Mattress Firm over Casper? Continue to short strip mall landlords. â€¦operating performance deteriorated in the fourth quarter of 2018 well below our expectations due to large volume declines with top customers and industry headwinds, leading to adjusted leverage increasing to near 11x as of Dec. 29, 2018. *Who stands to make money from such an IPO? Investors include Target Corp. ($TGT), Lerer Hippeau Ventures, IVP and New Enterprise Associates. Leonardo DiCaprio, Kyrie Irving and 50 Cent are also early backers. **Mattress Firm had approximately 3250 stores on its chapter 11 bankruptcy petition date. According to certain bankruptcy materials, the company indicated that it would shed approximately 700 locations. Thanks to an overly aggressive growth-by-acquisition strategy, you could essentially turn left and see a Mattress Firm, turn right, see a Mattress Firm, and turn around and see a Mattress Firm. While these acquisitions have allowed Mattress Firm to enter major markets in which it previously did not have a significant presence, and to significantly expand its share of the retail market, they also left Mattress Firm with too many newly-rebranded stores in close proximity to existing Mattress Firm stores. The result has been a significant increase in Mattress Firmâ€™s occupancy and related costs and a negative impact on the profitability of hundreds of its stores. There are many examples of a Mattress Firm store being located literally across the street from another Mattress Firm store.